>Wonderful Kansas! Dogs were smiling and having fun! I really like this photo. Not because of the bird, but because of the memory of this hidden corner from the masses! As I was climbing a Jerry-rigged fence, I noticed my setter on point…of course I just about got impaled on the top strand when I saw her tail feathering in the wind. This handsome guy was hiding at the back of a walk-in area that was being over looked by pheasant hunters but not by this quail junkie and his canine cohort! We found an enormous Junk Yard Covey not less than 20 feet from where this fellow was hanging! I managed to find the rear trigger on my double and take two on the covey rise! Miracles can happen! 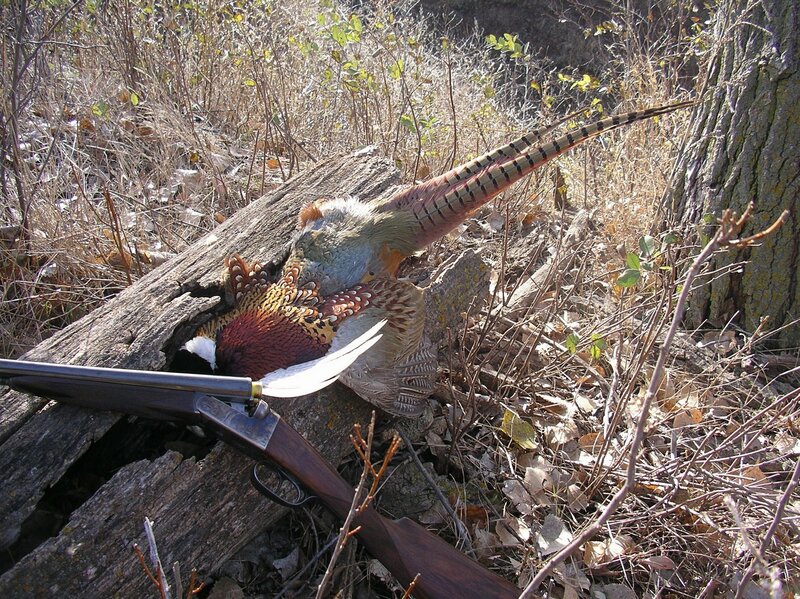 >Did that pheasant fly into a fence post and commit hari-kari?Heh, heh, heh. >Oh, there are two of them there. Mid-air collision? >Looks more like constipation to me.